Spring has sprung and life is slowly creeping back into the earth. For many people, spring is one of the most exciting times of the year around their home because it means that they can begin planting and tending to their garden once again. Some people like to plant strictly flowers, others a mix of vegetables, herbs and flowers. 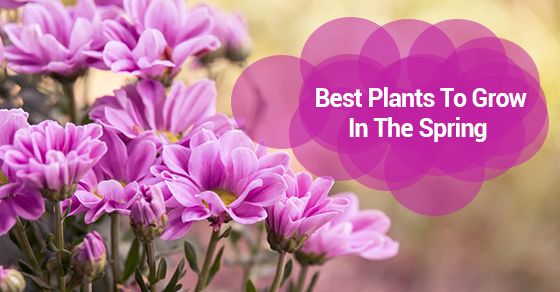 If you are thinking about starting your first spring garden, or want to change up what you planted last year, below are the five best flowers to grow in the spring. Bachelor’s buttons, also known as corn flowers, are about the most vibrant blue flowers that you can possibly plant this year. You can plant the seeds directly into the ground after the last frost in your area. Cover them with around an eighth of an inch of soil, and make sure that they are receiving either full sun, or only partial shade. If you are planning on putting these beautiful purple flowers into your garden, it’s a good idea to give them a head start indoors before transferring them outside. Many gardeners recommend letting these flowers bloom before it has gotten too hot. It is also recommended that you soak the seeds overnight before planting. Cover them with about one and a half inches of soil and grow them in full, direct sunlight. The seeds of these bright yellow garden favourites should be sowed as soon as you are able to work the soil in your garden. Space the seedlings 12 inches apart and cover with half an inch of soil. You might want to do some research into the best variety to plant in your area. This beautiful purple flower is another one that can only be planted once you are certain the last frost has left your area. They need to be covered with about an eighth of an inch of soil. These flowers love constant moisture, so make sure to give them plenty of water, and they thrive best in partial shade. These elegant spring flowers are easy to grow, are edible and make great additions to salads. These flowers are notorious for not being good transplants, so it works best to sow them directly into the soil or planter where you would like them to grow. You really need to make sure that the last frost has come and gone before you consider planting these flowers. Plant Nasturtium in full sunlight, don’t over water and don’t grow them in overly fertile soil. Cultivating plants is one of the most rewarding hobbies out there. It’s no surprise that so many cultures across the world have such great respect for planting and caring for flowers. If you want your garden to truly shine this spring, consider planting some, or all, of the flowers mentioned above.